How Does Nutrition Influence Development? What Is the Impact of Dietary Folic Acid Fortification on the Risk of Birth Defects? Two landmark studies published in the early 1990s proved conclusively that folic acid could reduce the risk of neural tube defects (NTDs) and led the United States Public Health Service (USPHS) to recommend that all women of childbearing age capable of becoming pregnant take 400 micrograms of folic acid daily. It is unfortunate that this recommendation was followed by only 30-40 percent of American women. The USPHS recognized that another strategy was needed to deliver folic acid to all women at risk and required fortification of enriched cereal grains, e.g., bread, pasta, and rice, with 140 micrograms of folic acid per 100 grams of grain. The impact of this effort has not been easy to measure. In the USA most NTDs are diagnosed prenatally and many pregnancies are terminated without being identified in vital records. Thus, looking at rates reported on birth certificates results in missing many cases. Many countries have now implemented mandatory grain fortification programs, and the reduction in risk has been well documented (Figure 1). Comparing rates in US and Canadian studies showed that the drop in rates was greater in areas where ascertainment was more complete. As shown in the figure, the drop in rates is also related to the starting rate; higher risk populations show greater reductions. This difference in rates is probably due to a combination of factors: some populations have low folate diets and some are genetically at high risk. Newfoundland had higher rates than most areas of Canada, probably because their folate intakes were insufficient and the Irish and Scottish background of the inhabitants put them at high risk because of genetic factors. Figure 1. Changes in neural tube defect prevalence rates following mandatory fortification of food with folic acid in selected populations. Ascertainment of cases varies by area; some include prenatally as well as postnatally diagnosed cases. Therefore, the denominator may be births or pregnancies. The variation in rates and changes in rates highlight an important issue: it is not clear how much of a reduction in rates should have been seen. The Medical Research Council trial found a 72% decrease in NTD rates but the confidence interval extended from 29% to 88%, and the women in the trial were not typical because all had a history of previous affected children. Other trials do not have a sufficient number of subjects to determine what the expected benefit should be. As noted above, the benefit has been shown to be related to the pre-fortification rate and has been quite variable even in areas where both pre- and postnatally diagnosed cases are included. Thus, it remains uncertain exactly what the target reduction is. The figure illustrates the change in rates following mandatory fortification in selected countries. Keeping in mind the differences in ascertainment and genetic background, the reductions ranged from 15% to 80%. The average was 46%. This drop is consistent with the effect expected based on the early case control studies. It is also consistent with the effect predicted by modeling based on giving women various doses of folic acid to determine how much was needed to reach blood folate levels known to be protective against NTDs. Are there more folic acid preventable NTDs? Two US studies indicate that there may not be. The investigators interviewed women who had NTD pregnancies and women who had unaffected pregnancies. They found that women who had an affected child were not significantly less likely to have used folic acid supplements. Their data suggest that, because folic acid supplement use was not a factor, the amount of folic acid in fortified food is sufficient to prevent folate-related NTDs. Conversely, there has been little change in NTD rates in Europe where mandatory fortification has not been instituted. It is well known that some NTDs are due to maternal diabetes, teratogenic drugs like valproic acid, and obesity where the beneficial effects of folic acid are not totally clear. Moreover, some have well defined genetic causes that are not related to folate status. So we know that not all NTDs are folate preventable. Can folic acid prevent defects other than NTDs? We now have data from numerous studies that examined birth defect rates before and after mandatory fortification. Although some reports found significant decreases in rates of other defects, these decreases could be chance findings because so many defects were studied. It is useful to compare studies because chance associations would not be replicated. In fact, no other defects were consistently decreased following fortification. Given that no other defect rates have fallen consistently in different populations, it is reasonable to conclude that only NTDs are folic acid preventable. It is worth mentioning, however, that the dose of folic acid most women receive from fortified food is modest. Therefore, it is possible that much higher doses could reduce the rate of other defects. There is considerable debate over other benefits and risks of food fortification. Food fortification can almost eliminate folate deficiency. Most trials have not shown a protective effect of folic acid on cardiovascular disease although recent studies suggest that there may be some benefit for stroke prevention. The benefits may depend on whether the population has adequate folate intake. Some have raised concerns that folic acid may be promoting the growth of cancerous or pre-cancerous lesions. A large meta-analysis showed a slight (relative risk 1.06), but not statistically significant, increase in all cancers (95% confidence interval 0.99, 1.13) in populations that had received high doses of folic acid during clinical trials. These data suggest that, if a high exposure did not produce a significant increase in cancer risk, the dose people receive from fortified foods is likely to be safe. In summary, folic acid has been a major success story. Food fortification with folic acid is one of very few modalities that can actually prevent a serious birth defect. Mandatory fortification programs have had a major impact in reducing the number of children who have NTDs. Ahrens K, Yazdy MM, Mitchell AA, Werler MM. Folic acid intake and spina bifida in the era of dietary folic acid fortification. 2011 Epidemiology. 22:731-7. Castillo-Lancellotti C, Tur JA, Uauy R. Impact of folic acid fortification of flour on neural tube defects: a systematic review. 2013 Public Health Nutr. 16:901-11. Czeizel AE, Dudás I. 1992 Prevention of the first occurrence of neural-tube defects by periconceptional vitamin supplementation. N Engl J Med. 327:1832-5. Daly S, Mills JL, Molloy AM, Conley M, Lee YJ, Kirke PN, Weir DG, Scott JM. 1997 Minimum effective dose of folic acid for food fortification to prevent neural-tube defects. Lancet. 350:1666-9. Kim YI. 2007 Folic acid fortification and supplementation—good for some but not so good for others. Nutr Rev. 65:504-11. López-Camelo JS, Castilla EE, Orioli IM. 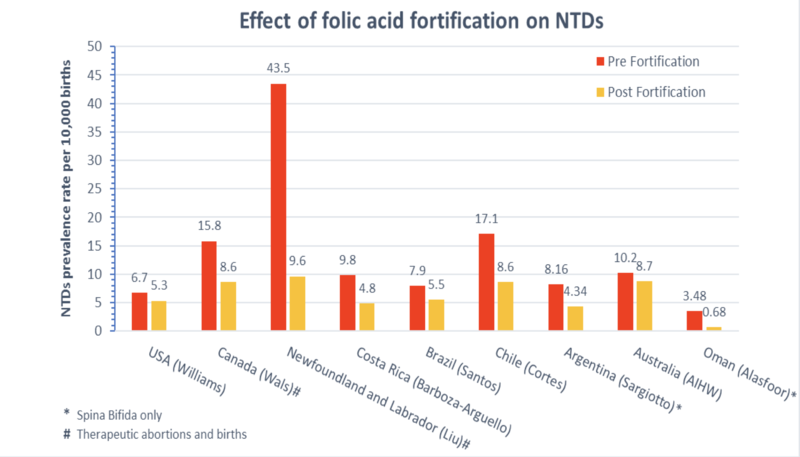 2010 Folic acid flour fortification: impact on the frequencies of 52 congenital anomaly types in three South American countries. Am J Med Genet A. 152A:2444-58. Mills JL, Signore C. 2004 Neural tube defect rates before and after food fortification with folic acid. Birth Defects Res A Clin Mol Teratol. 70:844-5. MRC Vitamin Study Research Group Prevention of neural tube defects: results of the Medical Research Council Vitamin Study. 1991 Lancet 338:131-7. Vollset SE, Clarke R, Lewington S, Ebbing M, Halsey J, Lonn E, Armitage J, Manson JE, Hankey GJ, Spence JD, Galan P, Bønaa KH, Jamison R, Gaziano JM, Guarino P, Baron JA, Logan RF, Giovannucci EL, den Heijer M, Ueland PM, Bennett D, Collins R, Peto R; B-Vitamin Treatment Trialists' Collaboration. 2013 Effects of folic acid supplementation on overall and site-specific cancer incidence during the randomised trials: meta-analyses of data on 50,000 individuals. Lancet. 381:1029-36.